It's been a tough few days without my trusty HP Pavillion laptop. It crashed three days ago in quite an ugly way so I finally gave up trying to deal with online solutions and windows Vista forums and help desks and took it off to my local " computer hospital" aka JWS Computers and a friendly geek named Brian. After two days of picking and probing, Brian told me the bad news.
" There's a bad sector on your hard drive" he said, " but that's not the worst of it--.the motherboard has issues too. To be honest, you would probably be better off getting a new computer". "But" I screamed, "how can that be? I've had this laptop for less than two years? Brian the unflappable nodded sagely and said " we see this a lot with these HP Pavillions.. I'm not surprised" Now it is true that any laptop used by heavy-blogging, amazon shopping, hypertweeting and emailing me gets rode hard and put away wet-- but still-- 15 months is not a very long life for a laptop-- especially when the warranty runs out after a year. Yesterday, feeling like a junkie in need of a fix, sweating, shaking, and anxious, I managed to borrow a laptop from my son the super techie. I logged on and began plowing through hundreds of emails-- there were sixty something messages in my stumbleupon toolbar, numerous twitter DMs and of course,Facebook. Need I say more? 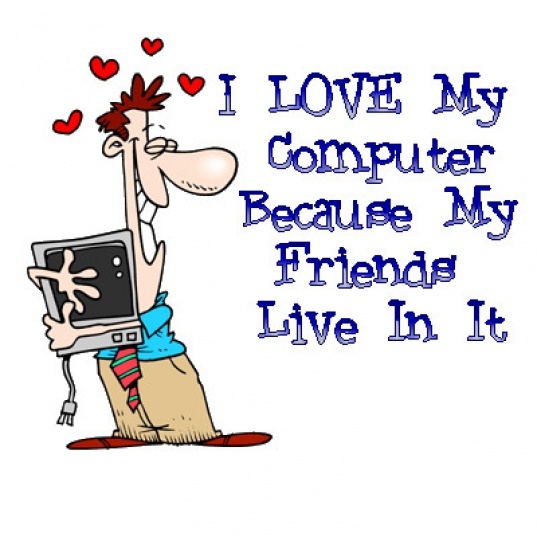 I have a whole life online--I have friends I value and whose lives I know much about whom I have never met in person. They are physically located all over the world and run the gamut in terms of age, gender, profession and educational background.. My online friends know things about me my neighbors don't, like my political views, for instance. They listen to my complaints and I listen to theirs. We tweet and blog and digg and stumble and share it all on our friendfeeds. Sometimes we are working together on actual projects. Other times we are just birds of a feather flocking together online. Whatever we are, I found out for three days just how important my cyberfriends are to me. 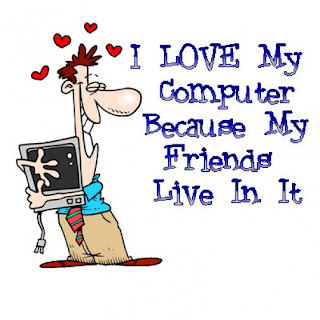 Call me an internet junkie, but my online peeps mean the world to me. I didn't realize how much I would miss them until they were gone.... but not to worry things are almost back to normal now and the only thing I have to decide is whether I am going to buy a Sony Vaio or a Macbookpro. I'll figure it out. I'm gonna do a little online research and take the advice of my cyber friends. Go Mac, Pink. At least you won't deal with the viruses. This from a PC person who'd love to switch. Up to you, natch, but have you considered a desk top instead? You get more for your money, and they can be tougher and longer-lived. Thanks Susan and London Girl--funny my first three computers were Mac desktops. I got my first laptop-- a Sony Vaio in 2000. I have to say that while I love the Mac OS and the fact that you don't have those endless updates from both Windows and the anti virus folks, they are still very pricy-- but I suppose you get what you pay for. All the manufacturers make lemons (kinda like car makers really). Can't rely on any one Brand. Back up religiously and get yourself a good warranty. You don't mince words, Amy :-) Thanks for the input... you are probably right. People ask why I keep a really old desktop (Windows 95!) and a dial-up connection. Call it my RV, guest house, whatever. If the DSL goes down or gawdforbid the "good" computer crashes (as it did this summer), I can still visit my friends. Slower than cold molasses is better than not at all! I have a Dell laptop Latitude C810 and its pretty old..... this hasn't been a problem lately and i haven't downloaded anything new. It seems to crash a lot when i open big programs like photo-shop and Mozilla!